Sporadic writings on ludic and paraliterary criticism. When Left 4 Dead 2 launched, I wanted to play the game with a friend of mine whose purview of gaming mostly involved World of Warcraft, some Baldur's Gate Dark Alliance, and a hefty amount of God of War. Twitchy, cooperative shooting was obviously not a significant part of his repertoire, so we had some catching up to do. Since L4D2 used the Source engine, I decided to ease him into the mechanics by getting him started with Half-Life 2, which was rewarding and fun in and of itself, but not just in terms of playing the game. It was fascinating to watch someone actually go through the process of internalizing a game for the first time, especially in a genre and/or engine where the controls and mechanics have become so conventionalized as to feel like second nature to me. I forgot how "raw" and immediate a new game experience can be, and how paradoxically immersive it can feel when everything is unfamiliar, clumsy, and potentially dangerous; like Gordon Freeman's slow disoriented stumble through the subway station and through queues leading to increasingly menacing locations, and the inevitable chase. I think we've all undergone the process, to a more or less embarrassing extent. You move your physical body and head around, overcompensating for the lack of effect on the screen, physically jump at surprise events or sounds, feel that "gut cringe" when making a risky leap, point the camera/crosshairs at everything within your sight that may be a threat or point of interest. Most of these immediate, affecting reactions seem to fade as you internalize the rules of the game world and your interface to it becomes more transparent. Experienced gamers take that moment of "awakening" into a new game for granted as a transitional one. It can last for mere seconds until the basic controls are understood, or it can linger for the first few hours until mechanics are clarified. Players are made to feel that one's mastery of the game is commensurate with building an experiential filter to process the "real" elements of the game and push the rest into the background. Designers have often considered this moment, or string of learning moments, to only fall within the scope of a tightly scripted tutorial phase, where the user is still cocooned from failure and allowed to internalize what was intended before moving on to the "real" stakes and engaging the player in the presumably higher registers of gaming: navigating narrative, decision-making, skill progression, character-building, tactics, etc. But one could argue that those other registers of interaction can lose some of their immersive qualities when the player's attention and involvement have effectively become indoctrinated, or rather tutorialized, in "the way things are" in the game, or in what is foreground versus background information. There's something to be said for letting some of that background bleed back into the gameplay and keep the player engaged and exposed, to keep that sense of being thrown to the wolves. Without this sense of exposure and risk, one finds conundrums such as in Modern Warfare 2, where details in the environment almost feel wasted when contrasted with the scope of the gameplay itself and the objects in the player's actual gaming foreground. Granted they do, as a gestalt, contribute to a sense of place, but that sense is mostly detached or running in parallel to the game being played. Even moments where one can stop and appreciate the little details of an environment tend to occur in proscripted, safe pauses in the action, or brief lapses of attention to the "real" game. But why frame this form of appreciation in what amounts to smelling the roses, rather than making it a key component of the foreground that one *needs* to understand, to process as a game object that needs to reckoned with if one wants to continue playing? Why not force the player to pay this sort of attention for the duration of their engagement with the game, without clearly staging safe spaces in which to appreciate it? Or if one needs a safe place to digest a piece of narrative or "drink in" a location why not force the player to create and assess that safe place for themselves? BioShock does this quite well, where the locale alternates between being the point of focus, the set piece, and being a trove of information one returns to plunder after neutralizing various threats. Demon's Souls goes so far as to adopt an "unreliable narrator" approach to the game world, where the player is constantly double-guessing the cues in her environment, always gauging the safety of a given location, the maneuverability and weight of her equipment, the good faith of the player who left a message scrawled in some godforsaken corner of the world promising "treasure ahead." Even the safety of the Nexus itself comes into question at later points in the game. It all adds up to a tremendously oppressive sense of place and makes the player "earn" the safety to appreciate it from anything other than a pragmatic, survivalist sense. I don't necessarily think that such an experiment in death by exposure would always guarantee a better game, and in some cases wouldn't even be applicable. Who would want a competitive FPS where the environment was a constant menace or liability? Most people who play those games look for that quality in their human opponents. They don't need the playing field to be an active threat. But we're beginning to see more games extending that sense of environmental unreliability and opacity into their foreground to great effect. It doesn't always require a complete rewrite of the premise or mechanics either. 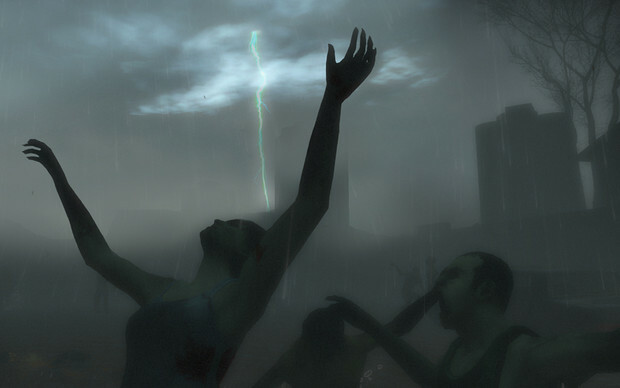 Basic changes like the torrential downpours and flooding in the Heavy Rain stage of L4D2 introduce this concept to fantastic effect, making you feel simultaneously helpless yet determined to carve out a safe path with the tools and skills your team has already acquired. It's not necessarily game-changing, but it's palpably player-changing, and I really hope we see more of these moments in future games.